Most family legacies are complicated, but Kimiâ Sadr's legacy is especially intricate. A master storyteller, Djavadi unravels Kimiâ's origin with family lore that has been passed down for generations, beginning with her Persian great grandfather in 1896. Each thread of the family's story builds the foundation for the family's harrowing escape to France during the Iranian Revolution. This book is a triumph and humanizes the history of a culture that many have ignored. Highly recommend. 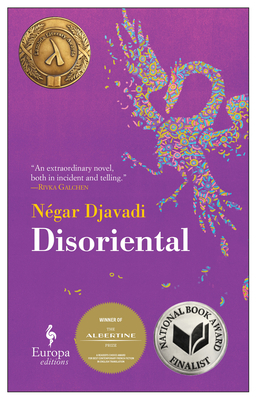 Disoriental is a rich tapestry of a novel, detailing the isolation and rebirth found in a life lived in exile. Djavadi's lyrical yet conversational voice is perfectly conveyed in Kover's translation, and she deftly weaves together the threads of Kimiâ's life with events in Iranian history.